In 1561 Robert Pursglove, retired clergyman and the last Prior of Gisborough Priory, founded a free grammar school and almshouses in Guisborough called the Jesus Hospital (also called Guisborough Hospital). This organisation was tasked with provideding free tuition in Latin to the sons of local farmers and tradesmen, and accommodation, clothing, food and a small stipend to twelve destitute elderly residents of Cleveland. The hospital lasted until the 1880s, when it was reconstituted into Guisborough Grammar School. The almshouses were closed, and a new school building was commissioned from Alfred Waterhouse, architect of the Natural History Museum in London. Guisborough Grammar School thrived, growing exponentially from one generation to the next, until the 1970s saw another big change. In 1971, the grammar school became Prior Pursglove College, a co-educational sixth form college. Female students were admitted to the sixth form for the first time, and the last fifth form graduated in 1974. 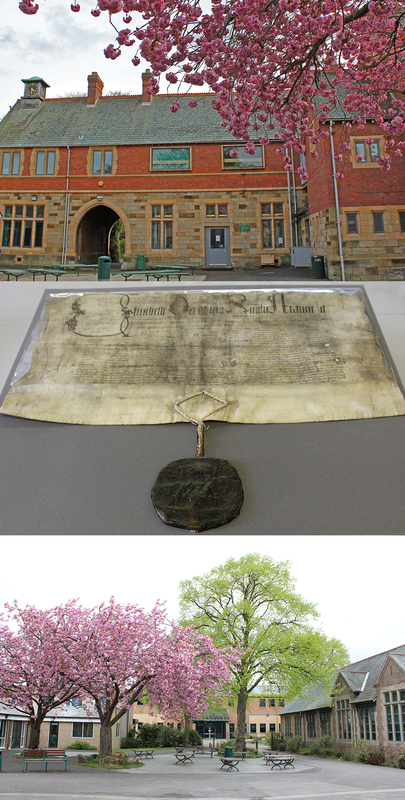 Browse this section to learn more about the 450 year history of Prior Pursglove College and our 800 year old archive. Click on the headers below to access each section. You can also go to the Archives, Photo galleries and People sections (accessed by the black menu bar above) to view our photographs and documents, and learn more about the long history of education and philanthropy in Guisborough. Browse this section for information about our medieval collections. We are very keen for researchers to work on our collections, and to help us better understand the history of the college, grammar school and almshouses. If you would like to contribute to this section, please email ppc.museum@pursglove.ac.uk with a summary of your research, or a proposal for research you would like to carry out. Browse this section for articles about the Hospital of Jesus - the free grammar school and almshouses which operated from 1561 until the 1880s. The Foundation Charter - read a translation of the foundation charter of Guisborough Hospital, written in 1561 and witnessed by Elizabeth I. The Statutes - Robert Pursglove's rules for the Jesus Hospital, which were followed for over 300 years. Hospital endowments - read about the land, property and rentals given to the Jesus Hospital in the 1560s by Robert Pursglove and others. Read more about Robert Pursglove, his politics, faith and philanthropy. Learn more about the Wardens in the sixteenth and seventeenth centuries. Find out about our rare Sixteenth-century leather spectacles. Read about life in the Almshouses. Robert Pursglove's grammar school in Tideswell, Derbyshire. The Buildings of Guisborough Hospital. Our oldest standing building dates from the 1880s, click the link to find out about the earlier buildings. In the 1880s, Robert Pursglove's free grammar school in Guisborough was reconstituted into Guisborough Grammar School. Find out about the school in this section. View our collection of the school magazine, The Guisborian. The Grammar School Rules, 1932. Girls in the grammar school: the preparatory class. Did someone from your family attend Guisborough Grammar School? View a list of students going back to 1885, a resource for family history researchers. In 1971, Guisborough Grammar School became Prior Pursglove College. Browse this section to find out more about the college. In this section, you will find information about the history of Guisborough, and the activities of our partner groups. Guisborough Town Hall and the project for Guisborough Heritage Centre. Towards a community museum: The Captain Cook Schoolroom in Great Ayton.